In the 6th century St Malo was a rocky island. It became a major merchant centre and by building a dam in the river Rance, an artificial harbor was formed. Because its strategic position in the Channel, due to transportlines to England and the Channel islands, it was heavily fortified in the 12th century. During the following ages many fortresses were built. These fortifications return in our view of the German strongpoints in St Malo. The area St Malo was K.V.Gruppe Rance, which means that all strongpoints had the designation "Ra". In January 44 just a part of it was declared as the Festung St Malo. From Fort de la Varde Paramé in the north-east until Pointe de la Haye in the south-west several fortifications protected the coast. To defend the Festung against attacks from the landside, the inner Landfront was used. In the middle of this pocket, inland batteries, AA emplacements and some logistics sites were constructed. Fort la Cité d'Aleth and Fort de la Varde Paramé were strong defended places with lots of mg and antitankgun bunkers. Many armoured steels parts of the bunkers remain. The combination with the diversity of bunkertypes makes this part of the Atlantikwall very special. Ile Cézembre is the absolute highlight. But unforunately the access to the island is since 2006 forbidden. The caves at Garde Guérin were open in 2007 and the cupola-tour around La Cité is a must. If you are lucky to get permission, do visit the two rare Mg/Pak bunkers type 642 in the Landfront west. We cover the area at the coast, from Pointe du Grouin untill St Briac and inland, from St Benoit untill Port Hue. In the preparation of our 2001 trip we received useful information from Pierro LeLouarn. The pictures are from our trips in 1996 and 2001. Additional pictures by Dennis de Zwart en Henk Adriaanse, 2007. 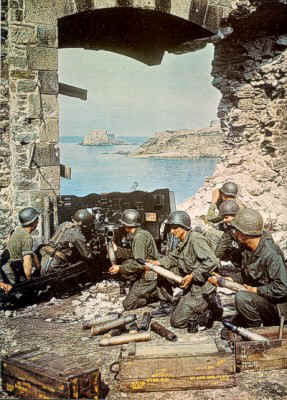 American 57 mm antitankgun is firing on Ra 224; the island is Fort National.